Yves Varin, left, national director of business development at Canadian Black Book moderates a panel of dealers, including Shawn Morris, Susan Gubasta and Ilya Pinassi. 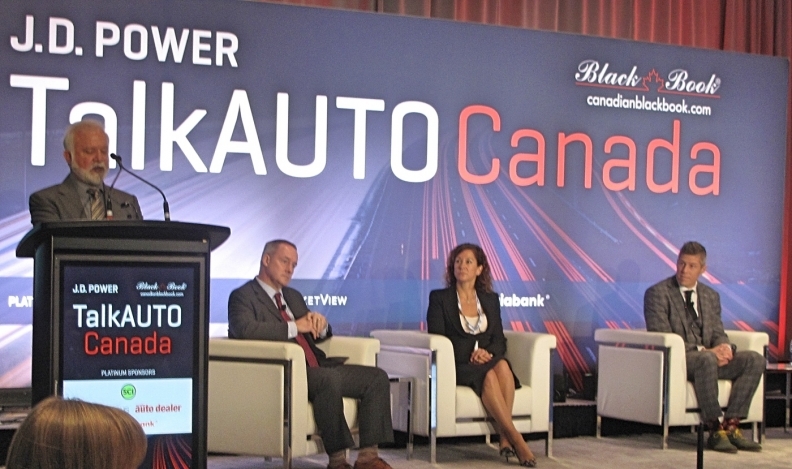 TORONTO — Consumer engagement in a digital world was the theme at this year’s TalkAUTO Canada conference in Toronto, presented by Canadian Black Book (CBB) and J.D. Power. Customers demand a different experience when it comes to digital retailing, the full house at the Toronto Congress Centre was told by CCB’s president, Brad Rome. “And the change is happening quickly. So it made a lot of sense for us to bring in people today who have the knowledge and insights in this area,” Rome said. Speakers included Andrew Tai of Motoinsight, and Josh Bloom of Facebook Canada, who spoke about how their digital-based companies are helping dealers navigate and thrive in the new digital world. Four dealers who are on the sharp end of the auto digital retailing stick, comprised the dealer panel portion of the program. Susan Gubasta of Mississauga Toyota spoke about her dealership’s recent move to let customers buy vehicles without ever visiting the store. In the first month after launch this spring, the dealership sold two that way, but the next month they sold 10, and about 10 a month thereafter. Ilya Pinassi of Parkway Motors Hamilton noted that their operation recently installed a new DMS, which can do everything digitally. But, that’s not to say the dealership is entirely digital ready. “It’s challenging to change. We’re doing baby steps. Everyday gets better,” Pinassi said. One aspect that was particularly embraced by customers, Pinassi said, is the ability for them to pay for service work or deposits by PayPal and through other online financial services before the customer arrives at the store, to get that out of the way. They appreciate the convenience. Norman J. Hebert of Quebec-based Groupe Park Avenue, said that his group developed custom software to capture leads that don’t come in a natural digital form, such as walk-ins and phone callers. The group also prefers to have online leads handled exclusively by its business development centre (BDC). On the other hand, Shawn Morris of Endras Automtotive Group, said that operation switched back to used salespeople making the first digital contact, instead of the BDC. Morris said this way is more suited to used car buyers, who have very specific questions about very specific units listed in inventory, and the salesperson is the best person in the dealership to provide that quickly.